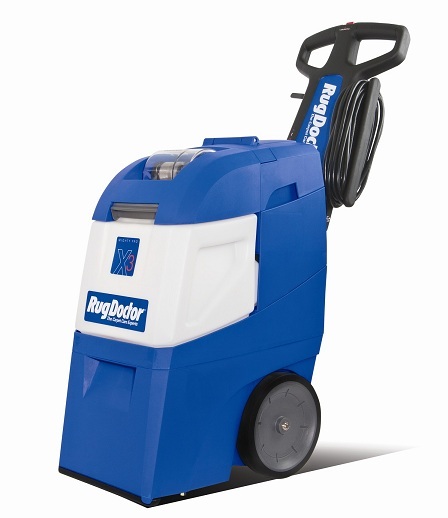 Rug Doctor Mighty Pro X3 – The blue version is sold to consumers. The classic red version is used for rentals. The Rug Doctor Mighty Pro X3 machine is perhaps the most popularly known carpet cleaner sold to serious home users today. It is a commercial grade machine that is built with high quality workmanship and powered to clean effectively. Many users over the past 3 decades attest to the fine results they have gotten from using a Rug Doctor. While the Rug Doctor is certainly a pioneer and dominant player for DIY home carpet cleaning equipment for a long time, consumers now get to choose alternative models from companies like Hoover and Bissell as well. The Rug Doctor has a stronghold because of it’s high quality workmanship and massive cleaning power. In this review, we will look into the main features and benefits of the Rug Doctor carpet cleaner, how well it cleans, and how its performance rates against other popular home carpet cleaning machines. In particular, this review is for the Rug Doctor Might Pro X3 model, which is the official blue colored Rug Doctor carpet machine sold (not the red colored rental unit or an older model). Vibrating Brush Technology – The Rug Doctor Mighty Pro X3 machine comes with its patented vibrating brush technology that is able to loosen and bring out dirt from carpets effectively. High 1.74 HP Horsepower – A high power amperage for the motor, together with a 28 psi power pump ensures that dirt and stains are eradicated from carpets. That said, regular carpet cleaners like the Hoover Steamvac with Clean Surge is fast catching up with a 12 amp amperage, which is very close to the power of the Rug Doctor motors. 10.8 Inches Path Width – The cleaning path is fairly standard for carpet cleaners across the board. Adjustable Handle – The adjustable handle allows for users to adjust the height of the handle so it is more comfortable to handle the machine. The adjustable height varies between 32.5″ to 36.5″. The handle can also be folded down when storing, saving room. Separate Clean And Dirty Water Tanks – Clean and dirty water tanks are separated. This makes it easier to fill and refill the water tanks. Most carpet shampooer users prefer a separated two-tank system like what the Rug Doctor has. Hot Water Cleaning – The clean water tank can be filled with hot water for better cleaning of carpets. People call this machine the Rug Doctor steam cleaner, but there is no actual steam used. This is standard practice for products labeled “steam” carpet cleaners as well (“steam” can be considered a misnomer). Long Hose & Tools – The Mighty Pro X3 Pet Pack comes with a 12 inch hose and an upholstery/stair tool. This is great for cleaning the stairs, sofas, chairs, autos and other hard to reach areas. 5 Year Warranty – The Rug Doctor Mighty Pro X3 carpet cleaner comes with a 5 year limited warranty. 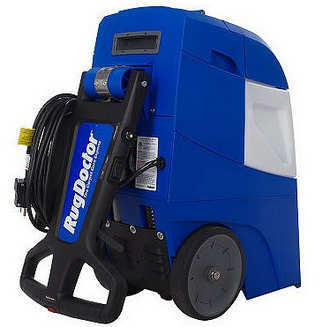 Other Rug Doctor models: Rug Doctor also has a domestic-grade upright carpet cleaner machine. It’s slightly less powerful, but also lighter and less expensive. You can check out the Rug Doctor Deep Carpet Cleaner here. Alternatively, if you are looking for the new small compact Rug Doctor spot cleaner, check out the Rug Doctor Portable Spot Cleaner Review. For many users, the efficacy of the Rug Doctor shampooer at cleaning out dirt and stains is astonishing. Users describe white and light colored carpets returning very close to their original color and how nasty pet stains were totally lifted through using a machine like the Rug Doctor Might Pro. The results have been variously described as “amazing,” “as good as professional carpet cleaners,” and “better than any other machine I’ve tried.” The Rug Doctor is a commercial quality machine, and it does deliver very high level results. The consensus from most users who have experience with both the Rug Doctor and regular grade machines is that the Rug Doctor cleans much better. Compared to a popular regular-grade upright model like the Hoover SteamVac with Clean Surge, many users agree that they see better results. Users who were previously using other machines have commented that they did not even realize that their carpets had so much dirt embedded until they ran the Rug Doctor on it. However, cleaning results when compared to another commercial grade machine like the Bissell 86T3 Big Green Deep Cleaning Machine is less impressive. Many users who have tried both machines see better cleaning results from the Bissell 86T3 Big Green professional cleaning machine. For more information, check out this comparison video. One of the key reasons that users like the Rug Doctor Mightly Pro X3 is it’s commercial grade build. The machine is built to last for many years to come. One frequent complaint with regular grade machines is that they are rather flimsy in build. Regular grade machines are also known to more frequently wear out after a few years of active use. The value in getting a Rug Doctor is the assurance that one can own a reliable machine that cleans carpets really well and lasts. This translates to a lower cost over the long run. See more comparisons between professional/ commercial machines and regular upright grade models. Most users find the Rug Doctor machine easy to use once they have read the instructions. It may not be intuitive especially if you have never used a carpet cleaner before. Once you have gone through filling the tank and running a few cleaning strokes, it’s all about repeating a few simple steps. The two-tank system makes it easier to empty and fill the tanks. In addition, the long 12″ hose and hand tool allows users to easily clean stairs, stained areas or hard to reach places. One criticism of the Rug Doctor’s usability is that the large sized tanks make it difficult to fill the tanks under the sink. Unless you fill it at the bath tub or shower area, you may have to use another a separate bucket to fill the tank. One weakness of the Rug Doctor seem to be the long time it takes for carpets to dry after use. This could be due to it’s lower suction power, as well as the how the machine operates. The machine only suctions water when you pull it backwards. That is less effective than machines which will continue to brush and suction on both forward and backward strokes. In addition, the machine appears to release a lot of water during the cleaning process, which affects its water usage efficiency (next point below). The length of drying time is not just weaker against a comparable commercial grade machine like the Bissell Big Green Deep Cleaning Machine. Some users also found that it performed less well than the Hoover SteamVac or Hoover MaxExtract 60, which are regular grade upright carpet cleaning machines. A number of users have also pointed out that the machine seem to run release a lot of water for cleaning carpets when compared to other machines like the Hoover SteamVac or Bissell Big Green Deep Cleaning Machine. This means that the machine runs through a lot of water in order to clean a room effectively. This can mean added hassle in terms of frequent refilling of the tanks. The Rug Doctor Mighty Pro X3 carpet cleaning machine weighs 39 lbs. Setting up and cleaning the machine on one floor is fine, as it has wheels to roll on. However, if you need to carry it up and down the stairs a lot, it may be difficult and tiring. Some have tried the Rug Doctor and simply feel that the superior cleaning results is not worth the hard work needed to operate a bigger machine, and settled for a regular upright carpet cleaner like the Hoover SteamVac. The Rug Doctor Mighty Pro X3 Jet Pack comes with a 40-oz bottle of Pet Formula Carpet Cleaner and 17-oz Urine Eliminator Trigger spray. These are generous sizes of sample cleaning solutions included with a carpet cleaner. If you are looking to clean more than a room, consider getting some additional cleaning solution as well. Customers usually get these: Rug Doctor Oxy Pro Carpet Cleaner, 64oz and Rug Doctor Pet Pro Carpet Cleaner, 64oz . An owner of this machine, Jenn, described how she had owned the Rug Doctor for 6 months and liked both the quality of the machine and the results. Although it cost her twice as much as other cleaner machines she had owned previously, she believed that it was worth paying more for something that would last longer. An owner of this machine from southern CA explained how he was in the middle of cleaning his home carpets when his consumer-grade models broke down. He replaced it with a Rug Doctor, noting that the consumer-grade he had used would break after a couple of years. He liked how well the Rug Doctor machine cleaned his carpets, suctioning out dirt that his previous machines seemed to have missed. Joe, carpet cleaning professional, uses the Rug Doctor for professional cleaning jobs. Watch how he was able to clean up a dirty apartment carpeting with this machine. Should You Buy The Rug Doctor Mighty Pro X3? Before you purchase, we do recommend comparing the Rug Doctor against the Bissell Big Green Deep Cleaning machine. This is also a commercial grade machine in the same price range. This Bissell commercial machine benefits from more updated engineering to provide even better cleaning effectiveness, water suctioning efficiency and faster dry times. Overall, the Rug Doctor Mighty Pro X3 is a worthy purchase if you are looking for a machine that cleans better than regular upright carpet cleaners. It may be a little more expensive upfront, but it is likely to last for a long time, so buyers do get good value for their money. Not sure if the Rug Doctor carpet cleaner is right for you? Check out the professional/commercial carpet cleaning machines section for more choices. The Rug Doctor has also introduced two new models in recent years that you may find more suitable for your needs: A consumer-grade upright home deep cleaner that is smaller and less costly. It is meant for regular home carpet cleaning, and competes against machines like the Hoover Power Scrub or Bissell DeepClean Deluxe Pet. Besides, there is also a small compact Rug Doctor model for spot and stains cleaning, learn more here. For regular consumer-grade home carpet cleaning machines, visit our homepage to see all the best ones. Hi!i would like to buy a washing machine for carpet.i want to know if you deliver to romania,who much it costs and how many days it will take to get it here,and the way of payment?